I've also used this week's fab sketch from Midnight Madness. I've used Promarkers and Copics to colour 'Megan'. Your little blonde girl is very cute. Love the colors you have chosen to go with her. Great job!! The Midnight Madness Design Team thanks you for joining us this week. Very cute and sassy, I can relate, my own daughter is named Megan!! Love the image and coloring and color choices of blue and brown!! How nice to receive in in mail. Thanks for playing with us at Midnight madness, be sure to join us again!! You are on top of this challenge. You rocked the sketch and the image is just so darn cute. I really like those flowers and your tiny buttons are adorable. Thank you so much for playing the Midnight Madness sketch challenges. Just loving coming to your blog, cuz I love dogs too. Yours are so sweet looking. Your profile pictures should be a post card it is so awesome. AWWW Teri I just love this Megan...I haven't inked her yet!! Thanks for the inspiration sweetie your card looks amazing! Nice colourcombo and lovely flowers and little buttons. Thanks for joining us this first challenge! Love the colours you have used, she is soo cute, I love these stamps!! Such a cute card. Your coloring is great. I love the brown and blue together. Nicely done. It is a pleasure to have you play with us, and I hope we will see you play again. If you like blog candy, pop over to my blog and sign up. I have some really fun stuff up for grabs. 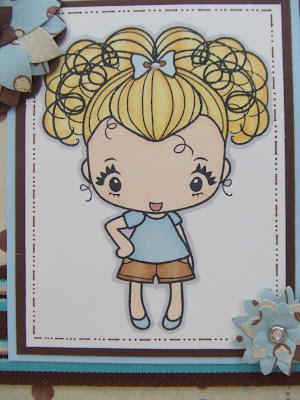 Teri, Your Anya is adorable...love all that blonde hair!! Your coloring and dp is just perfect. Love this card! Thanks so much for playing with us. I just love your adorable little card. The color selection is great. The blues and browns make this card so elegant. Lovely job on the MMSC challenge. Thanks so much for playing along with us this week! Your colors are outstanding. Your image is just so cute and stylish. You did an outstanding job with creating the flower. Just fabulous. Thanks for playing and sharing your creativity.